This Is Getting Old: Get Out Of Milwaukee Now! Get Out Of Milwaukee Now! The Pirates got swept by the Brewers losing the series finale today 1-0. 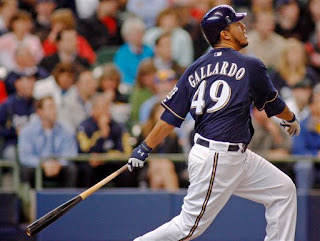 Milwaukee starting pitcher Yovani Gallardo struck out 11 and also homered in the 7th. The Pirates as a team struck out 12 times. It was the Brewers 15th straight win over the Pirates and the 18th in a row at Miller Park. Ouch. Ian Snell had another good performance allowing just 5 hits in 7 innings. He struck out 5 and walked 4. 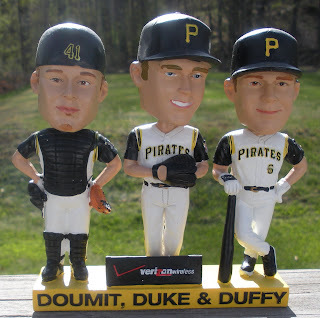 One other note, Chris Duffy had his first hit of the season for the Brewers, doubling in the 5th, which made me remember the worst bobblehead in Pirates history. The Bucs are off tomorrow then return home to play the Reds on Friday.